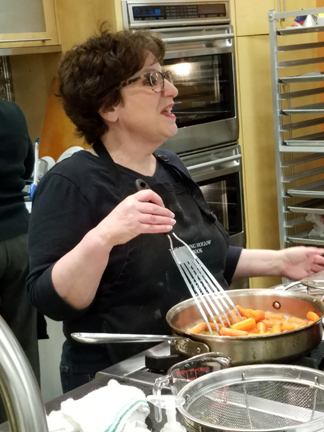 Here I am stirring carrots and holding forth about maple syrup. Happy spring! The snow is receding in Hawley, Massachusetts. Can daffodils be far behind? Yesterday I returned to teach a class at the Baker’s Pin in Northampton. I love this kitchen store. It has just about anything one could need for one’s kitchen (and lots of stuff one doesn’t need but wants). The staff is friendly and knowledgeable. And the owners let me come in from time to time and teach a class. We’re at the tail end of Maple Month so my class last night featured a full meal of maple. 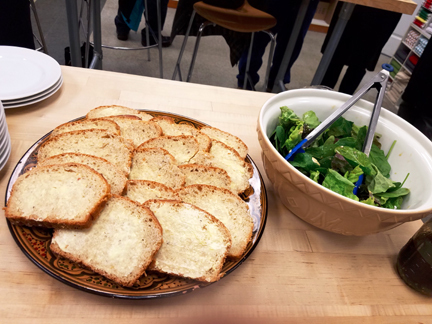 The students did a wonderful job of chopping, kneading, mixing, baking, and sautéing. I had very little to do—which suited me just fine. We had a great group, including a couple from New Hampshire whose family has been boiling maple syrup for 160 years. Their children had given them the class as a Christmas present because the two had tons of maple syrup and no idea what to do with it. I was too busy guiding the students and droning on about the history of maple syrup to get my camera out, but luckily one of the store’s wonderful employees, Louisa Teixeira Bushey, took some photos. We started the meal with a green salad (spinach and arugula with crumbled Gorgonzola) tossed in my maple balsamic vinaigrette. To accompany the salad, we munched on Swedish oatmeal bread. The bread recipe appears in my Pudding Hollow Cookbook made with molasses. I find that maple syrup makes it even better—more delicately flavored but just as sweet. Elaine Ostergren taught me to make this bread. Elaine was a Swedish-American woman who directed the choir in my church for many years. A cryptographer during World War II, Elaine raised a large family and still managed to take in foster kids with her husband Cliff. They were a darling couple, and I like to think of them when I make this bread. Those of you who celebrate Passover won’t be able to make it for a few days—but it would make a great addition to an Easter meal. I hope any holiday you celebrate at this time of year is a joyous one. Cover the oatmeal (barely) with the boiling water. Add the syrup, 2 tablespoons of the sugar, the salt, the butter, the anise seed, and the egg. Add 2 cups of the flour and mix well. Soften the yeast in 1/2 cup warm water in which you have dissolved the remaining sugar, and add it to the other ingredients. Add enough of the remaining flour to make a dough that begins to hold together. Knead for 5 to 10 minutes, until elastic. Place the dough in a greased bowl, and let it rise, covered with a damp towel, in a warm spot for 4 hours (less if using rapid-rise yeast). Punch down the dough, and shape it into 3 loaves. Place them in greased and floured loaf pans, and let them rise for another hour. Bake at 325 for 1 hour. Makes three loaves.